Minnesota Twins catcher Joe Mauer didn't make the All-Star cut this year. But if his rookie season is any indication, he'll be rubbing elbows with the league's other top talents in a not-too-distant All-Star game. Mauer, 21, has the highest slugging percentage on the team, and an approach to the game that has earned him accolades from coaches, teammates and fans. Minneapolis, Minn. — Expectations have always been high for Joe Mauer. 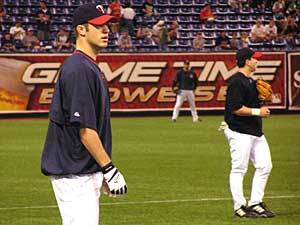 Long before the Twins chose the St. Paul native as their top draft pick in 2001, Mauer was considered a sports phenom. At Cretin-Derham Hall High School he was a star quarterback, leading his team to the state football championship in 1999. In basketball, he averaged more than 20 points a game. And in baseball, his batting average exceeded .500 every year and he only struck out once. Ever. In the minors, Mauer was equally impressive. So it didn't surprise anyone when the Twins decided to bring him up to the big leagues this spring. On opening day, Mauer was positioned behind home plate as the Twin's regular catcher. And he was eighth in the batting order. One game, later he injured his knee and was out for eight weeks. Mauer didn't disappoint fans when he returned to the lineup last month. His .311 batting average is tops on the team. And he's hit six home runs since his return -- more than any of his three seasons in the minors. Those kind of numbers prompted Twins manager Ron Gardenhire to take an unusual step. He promoted his rookie to the third spot in the batting order. "We were kind of scuffling, and weren't scoring any runs, and so I just thought, 'Why not?'" Gardenhire says. "He has good at-bats. He knows the strike zone. So let him swing." It's a good place to be by any measure, but if Joe Mauer is excited, it doesn't show. His approach is low key, even when talking about the season's high points. "I hit my first home run," Mauer recalls. "I caught three shutouts, just the other series. And now I'm hitting in the three-hole. So it's been a pretty good year so far." "It's real difficult to tell whether Joe had a great night or a bad night by the way he acts," says Jim O'Neill, Mauer's baseball coach at Cretin-Derham Hall. "He's pretty consistent in his behavior, and that's a good thing for a baseball player." O'Neill said his former student has been groomed for this job since he was a little boy. That's when Mauer's dad, Jake, created a contraption he later named the "Quickswing." The device dropped balls down a tube from eye level and released them at waist level. It helped Mauer develop his swing, said O'Neill. "Another guy that came from Cretin-Derham Hall, Paul Molitor, was very similar, had a good short swing," O'Neil says. "And they're both able to wait on the ball so long because they don't have the big swing. Like anything, you keep simple and keep it small or short, there's not a lot of holes in it and not a lot of room for errors." Twins fans are starving for the next Killebrew, the next Hrbek, the next Puckett ... and I think he certainly fits that mold. At a recent batting practice, fans began filling the Metrodome hours before that night's game. Dozens of kids lined up along the railing. Many were jockeying to get Mauer's autograph. Kelsey Hunstad, 13, was one of the lucky few who got the rookie to sign her worn leather glove. "I think he's really neat," Hunstad says. "He was the first person that I ever saw bat. So he feels kind of special to me." Outside the Dome in the sweltering summer heat, the story was much the same among tailgaters. Ryan Kroll of Golden Valley thinks Mauer can do no wrong. "As a Minnesotan, you can't help but root for him. I mean, he's local and you want him to do the best," says Kroll. "Twins fans in general I think are starving for the next Killebrew, the next Hrbek, the next Puckett and that kind of thing. And I think he certainly kind of fits that mold." It's a lot of pressure for anyone to live up to, let alone a 21-year-old. But so far, Mauer isn't showing any signs of cracking. "It's been fine," he says. "It's just a little more hectic than it has been the last few years. But I'm starting to get used to it." After the All-Star break, Mauer and his teammates hit the road. The Twins take on Kansas City next in a four-game series starting Thursday, followed by two games in Detroit.